Freshnessh, harmoniosity and fruit taste which reminds the fragrance of grapes of origin and the vintage perfume characterize this white dry wine produced in the heart of Sicily by a firm which does of quality its ensign. Appellation or Vine Alcamo D.O.P. 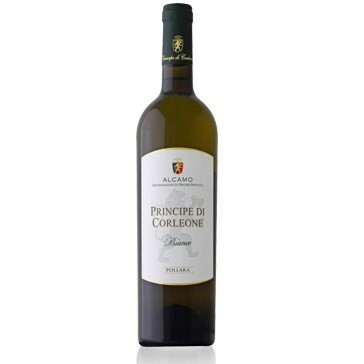 It is a fresh and harmonious wine, with notable character that reminds the fragrance of harvest. It has a yellow straw colour with pale green reflections. It comes from Catarratto and Inzolia grapes, cultivated in a territory with great grape-growing vocation, i.e. the zone of Corleone in Sicily. It goes well with hors d'oeuvre, soft cheese, excellent with fish and sea food. To be kept in a cool room and keeping the bottle laid down.